The peach tree is a deciduous tree that originated in China and grows to heights of up to 30 feet. The peach is an excellent source of fiber, potassium and Vitamin C. There are many uses for the peach, including jams, salsa, pies and ice cream. Peach trees can be difficult to grow. These trees require a lot of nutrients and attention in order to become successful, fruit-bearing trees. The Belle of Georgia Peach tree can be grown successfully throughout the United States with proper care. Choose two to three healthy peach trees in order to get the best results. The trees should be at least a year old. They should be 3 to 4 feet in height. The trunk caliper of the tree should be 3/8 to 1/2 of an inch. Trees that are this size are easily transplanted, and they're more likely to produce fruit. Plant your peaches in early spring after the last frost. The ground should no longer be frozen when your peach trees are planted. Choose an area to plant your peaches that will get at least 6 to 8 hours of sunlight per day. 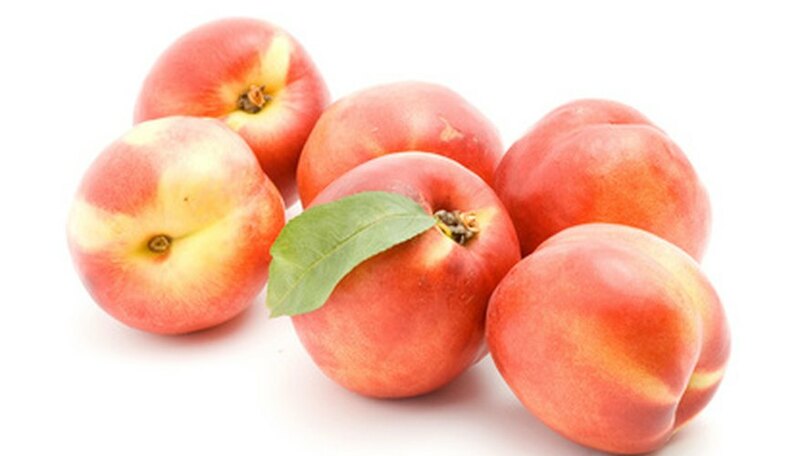 Peaches require a lot of sunlight for maximum yield and best quality. Test the soil before you plant your peaches. Georgia peach trees prefer a soil pH of 6.5. If the soil pH is high, you should add amounts of sulfur to the soil to lower the pH. Apply 10 pounds of dusting sulfur for every 1,000 square feet of soil. If the pH is too low, you should add limestone to the soil. Use 50 pounds of limestone per 1,000 feet. Follow the directions on the containers of limestone and sulfur for proper application. Dig a hole that is 5 to 6 feet in diameter and 10 to 12 inches deep. Add good organic compost into the hole, before you place your peach trees in the hole. This will ensure that your peaches get the nutrients that they need. Add a small amount of soil on top of the compost, so you will have a mound in the center of the hole. Place the tree into the hole. The root ball should be on top of the mound of soil and compost. The tree should be placed so that it is vertical and not leaning to one side or the other. Refill the hole with the dirt that you dug from the hole. Overfill the hole so that the soil is approximately two inches above the surrounding ground. The soil will compact down when it has been watered, and it will settle to ground level. Water your fruit trees weekly with at least an inch of water. Water your trees more during extreme drought conditions. Never allow the ground to become dry and cracked. Fertilize your new fruit trees a week after they have been planted. Choose a 10-10-10 fertilizer and apply 1/2 a pound approximately 8 to 12 inches away from the base of the trunk. Add mulch to the base of the tree to hold in moisture and to prevent weeds from taking over. Replace the mulch every year.